A small book from an epic landscape. Three parts: poems, photographs, geographical narrative. A writer accompanies a field expedition to a glacier; students from a Geography Department, a professor of Quaternary Environmental Change. Her first poems are minimalist, deadpan, tiny moraines, glacial deposits from a “Land / Bare and recently unbandaged”. The mountains are “generations of flatness”. But whooper swans fly over and the punctum shifts; to clean tongues, to a “he” who “is not coming back”, as if this place from which thoughts clamber away has an absent messiah. A volcano takes the place of a biblical villainess. Alyson Hallett begins by distancing herself and us from easy myth, with cold words. But she is soon incriminated: “I move a stone and everything changes... The stone dies to the life it was leading / each time we move it”. 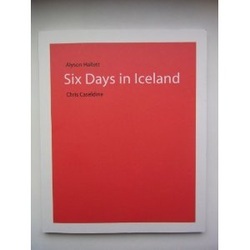 As if turning an ignition key in the landscape, the geography fires and the poems are transformed – painfully honest, they stretch to Iceland’s horizons of deforming ice and fire. Hallett knows about stones, she is her own glacier; lifting and carrying and placing stones in long journeys: www.thestonelibrary.com. But here the landscape is less personable, almost deserted, unpredictably dropping what it once picked up – the remains of camp equipment, rocks, bodies from a lost 1953 Nottingham University field trip soon. Hallett, “a roving widow”, carries her childhood landscape as the glacier carries its things: “deeply etched”: “If I am a poet I am also a tree, a heron... a deformed lamb, a deforming glacier”. Returning home, the glaciers are in her eyes. Then the wonder of this small book – the simple three part structure allows the poems to make a sensorium in which to experience the images and receive the professor’s calm narrative of creeps and moves, plastic ice, retreats and floods, hidden lakes, liquid fire and fossil sequoia. To feel the move of the pack ice that brings polar bears “killed immediately on landfall”. For a mythogeographer, reading doesn’t get much better than this.